This section describes using OpenDaylight with the VTN manager feature providing network service for OpenStack. VTN manager utilizes the OVSDB southbound service and Neutron for this implementation. 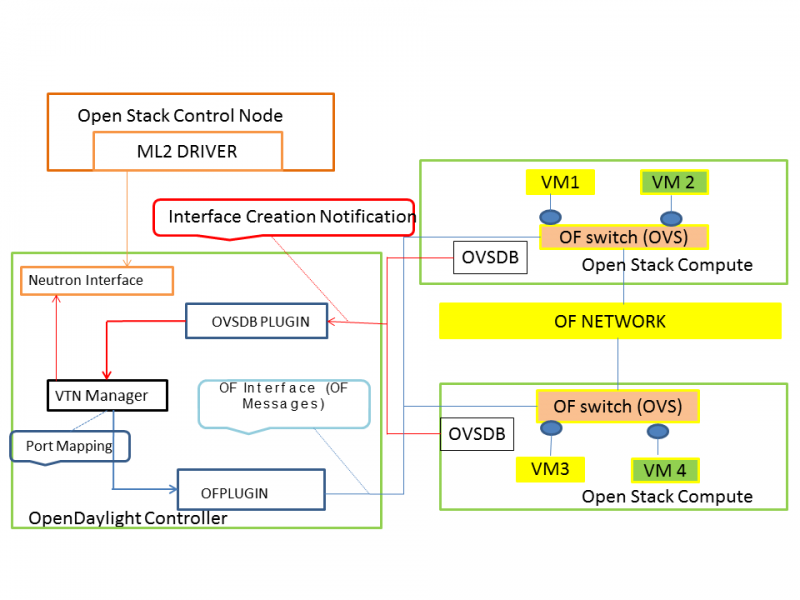 The below diagram depicts the communication of OpenDaylight and two virtual networks connected by an OpenFlow switch using this implementation. To make SELINUX as permissive, please open the file “/etc/sysconfig/selinux” and change it as “SELINUX=permissive”. After making selinux as permissive, please restart the CentOS 7.1 machine. This will end up with Horizon started successfully message. Change the jetty port from 8080 to something else as swift proxy of OpenStack is using it. Open the file “etc/jetty.xml” and change the jetty port from 8080 to 8910 (we have used 8910 as jetty port you can use any other number). Start VTN Manager and install odl-vtn-manager-neutron in it. Ensure all the required ports(6633/6653,6640 and 8910) are in the listen mode by using the command “netstat -tunpl” in OpenDaylight. sudo mysql -e "drop database if exists neutron_ml2;"
sudo mysql -e "create database neutron_ml2 character set utf8;"
sudo mysql -e "grant all on neutron_ml2. * to 'neutron'@'%';"
Please see the VTN OpenStack PackStack support guide on the wiki to create VM’s from OpenStack Horizon GUI. Install odl-vtn-manager-neutron feature which provides the integration with Neutron interface. It subscribes to the events from Open vSwitch and also implements the Neutron requests received by OpenDaylight. The ML2 implementation for OpenDaylight will ensure that when Open vSwitch is started, the ODL_IP_ADDRESS configured will be set as manager. When OpenDaylight receives the update of the Open vSwitch on port 6640 (manager port), VTN Manager handles the event and adds a bridge with required port mappings to the Open vSwitch at the OpenStack node. When Neutron starts up, a new network create is POSTed to OpenDaylight, for which VTN Manager creates a Virtual Tenant Network. Network and Sub-Network Create: Whenever a new sub network is created, VTN Manager will handle the same and create a vbridge under the VTN. VM Creation in OpenStack: The interface mentioned as integration bridge in the configuration file will be added with more interfaces on creation of a new VM in OpenStack and the network is provisioned for it by the VTN Neutron feature. The addition of a new port is captured by the VTN Manager and it creates a vbridge interface with port mapping for the particular port. When the VM starts to communicate with other VMs, the VTN Manger will install flows in the Open vSwitch and other OpenFlow switches to facilitate communication between them.